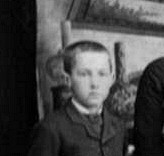 Richardson Lee in 1889 photo; age 16. 15197.667 Richardson Lee 8 BIGELOW, son of Daniel 7 ( Jotham 6 , Joel 5 , Jotham 4, John 3, Samuel 2, John 1) and Ann Elizabeth (WHITE) BIGELOW, was born at Olympia, Thurston, WA on 25 July 1873. He was known in the family by the name of "Ray". He married Belle Lucretia Knox on 18 January 1900. The only data we have on her is that she died on 02 March 1927. He died some 40 years later on 21 March 1967 at Walnut Creek, Contra Costa, CA and is buried in the Masonic cemetery at Olympia. 15197.6671 Frances Rovena, b 27 Jan 1903; d __ ; m Harold Skinman. 15197.6672 Raymond Knox, b 06 Oct 1911; d 27 March 1922. 15197.6673t Gordon Keith, b 25 June 1915; d __ ; m Sophia Leepish; res. Walnut Creek. CA. 2 children. Correspondence between Bigelow Society historian/genealogist and family members.